I gave Katie a waffle maker as a wedding present. It might seem unromantic, but at some point the humble waffle became a symbol of the future we were going to share together. We’d imagine the house we would own, the gorgeous kitchen we would create, and the ridiculously over the top breakfasts we would share there. Complete with fresh berries, freshly squeezed OJ, and of course – waffles. I’d never made waffles before, but after a first batch of plain ones, I decided that something was missing. And that something, as per usual, was chocolate. 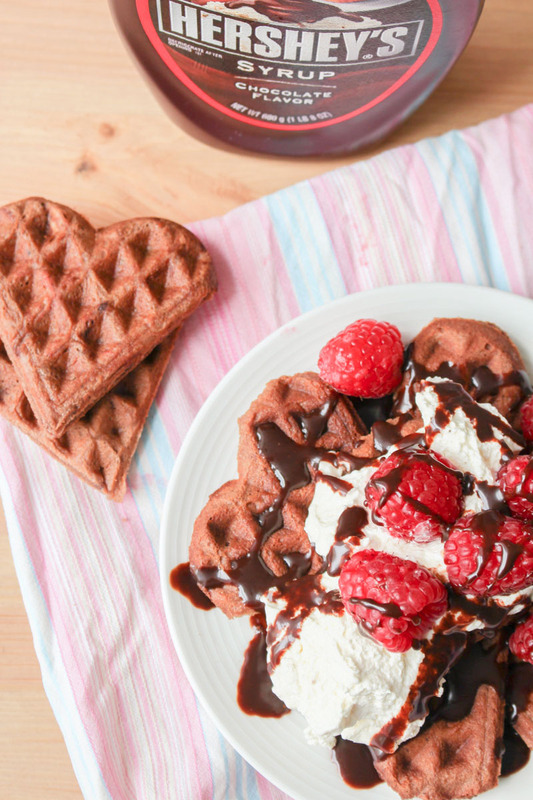 We might not have the dream kitchen, but there is nothing to stop us eating these chocolate waffles every morning for breakfast now. Apart from time. And giving ourselves diabetes. So maybe not every breakfast. Probably best to keep these beauties for special occasions. In fact, they are probably much more suited to dessert – serve them with raspberries, whipped cream, and chocolate sauce like we did, or try chocolate ice cream, chopped nuts, cherry jam, or marshmallows. Can I have all of the above? This recipe is adapted from here, with a few notable adjustments thrown in for good measure. I reduced the sugar by a third, because as a Brit I tend to find US recipes a little too sweet at times. Plus, my sugar intake is definitely too high as it is, so anything I can do to reduce it (whilst still getting my fix) is a great thing. I also switched out the white sugar for light brown (Katie’s idea). Brown sugar has a more caramel flavour than its white friend, something which is always great when baking with chocolate. I replaced the water with milk to give them a richer flavour, and also added half a teaspoon of cinnamon into the batter, because cinnamon and chocolate are a dream team, right? I also threw in a little bit more vanilla, because no recipe has ever not benefited from that. You are going to love this recipe most of all for how absolutely easy it is. Throw a bunch of store cupboard ingredients into a bowl and give it a whisk. Pop into a waffle maker. Done. But how do you know when the chocolate waffles are ready? I don’t know if there is any science to this – please let me know if there is – but I basically just waited for steam to stop coming out from the edges. Once that happened, I lifted the lid and grabbed the waffles. If your waffle maker is anything like ours, then batter will spill out of the front. But don’t worry about it – just trim the edges of the waffles once they are done to get rid of the excess that has spread. Or don’t. It’s up to you. I’ve been meaning to give video-making a go for a while, but what with all the wedding prep I just didn’t have the spare time to dedicate to it. But, after a couple of false starts, I’ve finally uploaded the first video to the What Charlotte Baked YouTube channel 🙂 And these waffles are the star! 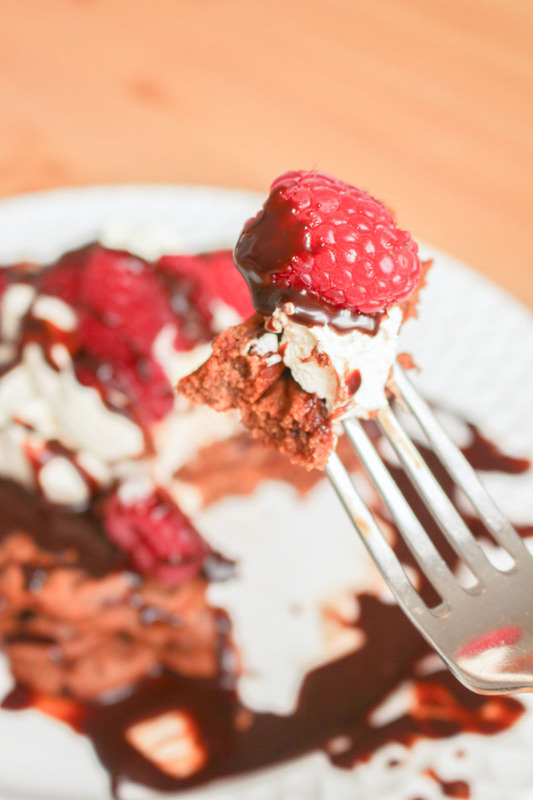 Light and fluffy chocolate waffles, topped with fresh raspberries and whipped cream, and drizzled with a generous helping of chocolate sauce. Perfect for breakfast, brunch, or as dessert. Break the eggs into a large bowl and beat well. Add the rest of the waffle ingredients, and whisk together by hand until combined. Do not over-mix, as you do not want tough waffles. There may be small lumps of sugar in the batter, but that is fine. Spoon the batter onto a preheated waffle maker (waffle iron) and cook for 3-5 minutes, or until the steam has stopped escaping from the edges. Place the waffles in a warm oven to keep warm whilst cooking the remaining batter. Whilst the waffles are cooking, pour the cream into a small bowl, and whisk until stiff peaks. 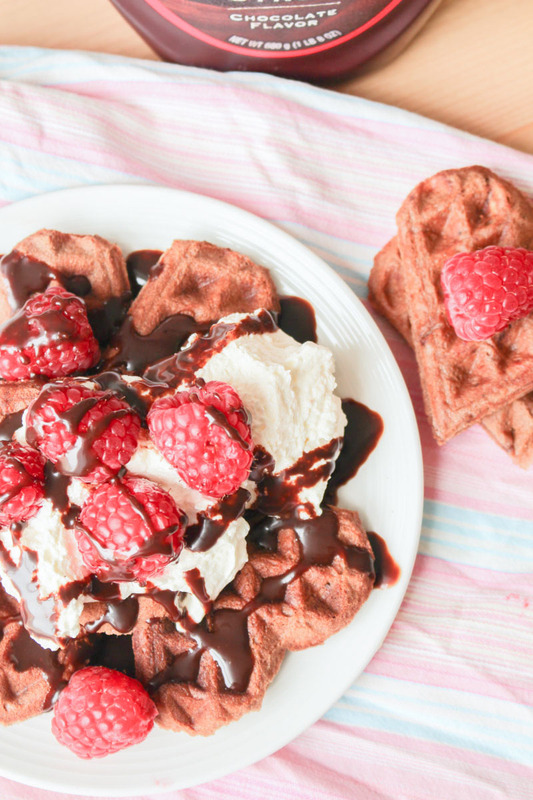 Place dollops of the whipped cream onto a stack of waffles, and sprinkle with fresh raspberries. Add a generous helping of chocolate sauce and serve warm. The waffle batter can be kept in the fridge for up to 48 hours if covered with clingfilm (plastic wrap) or stored in an airtight container. It may separate slightly, so make sure to whisk back together before cooking. Alternatively, the cooked and cooled waffles can be stored in an airtight container in the fridge for 3-4 days. To reheat, either use a toaster or pop under the grill. 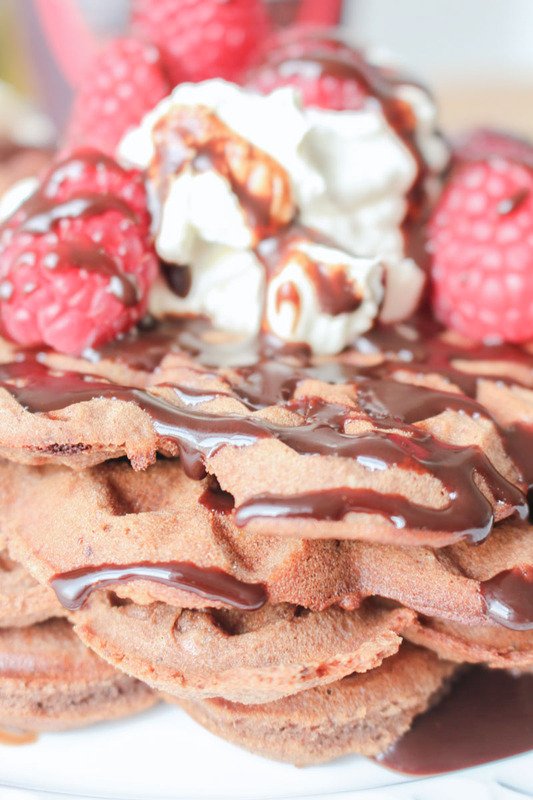 Cooked and cooled waffles can also be frozen for up to 2 months. Reheat from frozen in the toaster or under the grill when needed.